All days start with the getting up. But how are you doing it? If you are anything like me you probably keep snoozing the alarm, start your day in a bad mood or a mega rush and the rest of the day is normally a right off. I can tell you that without fail for most of my life, it hasn't mattered what time I wake up because whether I get up at 6:30, ro 8:00 I will still turn up for work 4 minutes past 9am....every...friggin...time! Why? Because I've been doing it all wrong. It's not about having enough time - although that helps of course - it's really about starting the day with the right attitude and best mindset to make the day a happy and productive one. So I've switched things up and now instead of arriving 4 minutes late I'm 4 minutes early - OK it's not amazing but I'm taking every minute I can! My new routine is still pretty new but it's been such a game changer for me I wanted to share it with you too, because I'm pretty sure I can put it all down to Yoga. I've been doing yoga on and off for a few years now so it's nothing new, but lately I've been making it the very first thing I do in the morning to start my day fresh and I'm pretty sure it's why I'm finally getting to work on time. By practising yoga first thing in the morning it means that I'm not checking my phone once before I hit the tube, and my mind is clear and in the right place to focus on what I really want to get out of the day. I know, I know, but it's so just easy to role over and have a quick skim through twitter or Instagram before you totally wake up right? But it's just such a bad way to start the day. A friend of mine one said something that has is stuck with me for life. He said he'd noticed that like every other animal on the planet, when his dog wakes up before he does anything he stretches out his whole body. So how come we don't do the same thing? It just makes sense doesn't it? By stimulating your brain with your goals, taking time to breathe deeply and stretching out your muscles you are setting yourself up with a limber body and mind to take on anything the day throws at you. At least that is my theory! It's also a great excuse to treat yourself to a little retail therapy (who doesn't want that?!) and pick up some new Yoga gear. I already have everything I need to get going but I decided to take the new routine as a way to treat myself and start positive from the off. So I went a'hunting online for new brands to try and got caught up looking at Lapasa Yoga Fit on Amazon of all places! I know and hands up Prime next day delivery?! Woop Woop! The whole range was a bargain price and had great ratings so I gave it a shot and I am happy I took the risk. Considering the price I think they're really good value, super comfy, great for hiding sweat (nice) and really flexible material - just perfect for my new routine, and so many colours!!! My Rainbow obsession is going crazy! So with all that said I've teamed up* to Give away ANY PRODUCT OF YOUR CHOICE from the Lapasa Range! All you have to do is finish this post and follow the rafflecopter instructions at the bottom of the page and leave a comment saying what your favourite piece and colour is from the Lapasa range. For inspiration these are the 3/4 pants I got and love! Get up the firs time the alarm goes and NO SNOOZE BUTTON! Grab a pint of water and set up my mat ready for some exercise. Get changed and open the curtains. Sunshine is a great way to boost your mood in the morning but if it's a miserable day crack a window, the fresh air will do you some real good. Before getting into your Yoga routine, sit down and take a moment to envision your goals, and what you want to achieve from the day. 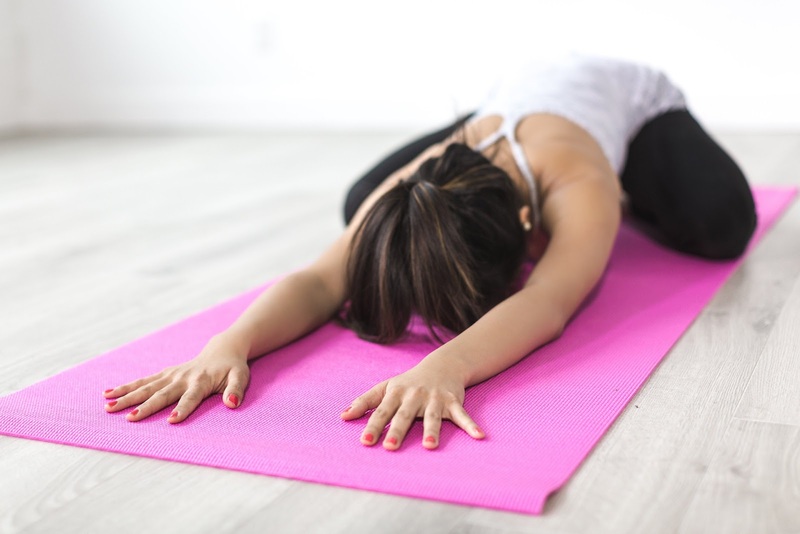 Begin your Yoga routine and take at least 5 minutes (10 is plenty to start your day right) to go through a set routine with 3 or 4 repetitions. If you're not sure what to do just head over to Youtube. I find this routine a great one to start off the day and it's perfect for beginners, and people with physical movement conditions like me. After your Yoga routine, you should be feeling relaxed, calm and with an open mind, take one last minute to take a comfortable seating position and just one last time think about your long term life ambitions and have them clearly in your mind, before you slowly get up, curling through your spine with a final last breathe out and carry on with the rest of your morning routine, and if you can make sure you eat it's so important to get your digestive system working to get you moving into the day. When you first start any new routine, I'll be honest it's not going to feel great. You might feel more tired than normal, a little irritable or moody, but if you stick with it you will really reap the benefits. I'd say the first 10 days is the toughest, but once you get passed that point it gets a bit easier, and by day 30 you'll be on a role. It's all about taking time out of your day to do something that not only motivates you to get up in the morning, like a personal treat everyday, but it will clarify your thoughts and intentions and make your body loose and limber, started your day fresh faced and relaxed. If you start a Yoga routine, let me know I'd love to hear your experiences and routine suggestions. If you do something else to motivate yourself to get up and start a good day, share your ideas in the comments as well. New suggestions are always welcome. OK enough from me, go start your day right, and enter that giveaway! *This post has not been sponsored. The Lapasa items will be kindly donated from Lapasa to the Giveaway Winner. Lapasa Women's Modern Cotton Bra, I would love a new brightly coloured cotton bra like this, they are so comfy! 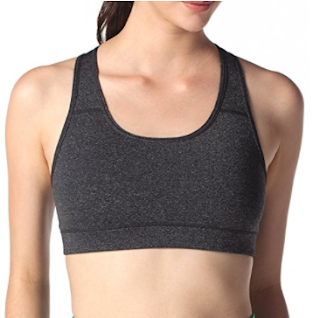 I would like the Lapasa Women's Sports Bra in black please. It would have to be the Slimming Capri in Black for me! I love the full length yoga pants in Heather Dark Grey! Purple space dye Slimming Leggings! The Slimming Leggings in Purple Space Dye. Yoga bra looks very comfortable. I'd go for the full length Slimming Leggings － SOFT WIDE WAISTBAND － Running Yoga Pants Hidden Pocket in Purple Space Dye. The 4-way stretch sounds super comfy! I love the dark green yoga leggings. I like the slimming leggings in heather blue (lovely colour). I would love the Lapasa Women's Slimming Leggings in Purple Space Dye!! I have started doing yoga in morning and finding it very effective. It helps me to stay active in whole day. Few days ago when I was looking for best quality yoga outfits then found out sports bra on a famous online store. Purchased them and glad to wear during sessions.